A woman recently contacted Downtown Legal Services after she was notified she was being let go from her low-wage accounting job. She wanted to know if the offer her employer made in her termination letter was fair. Like many people who ask the clinic for help, the woman couldn’t afford a lawyer, but still didn’t qualify for publicly funded legal representation under Ontario’s strict financial eligibility rules. Fortunately, the DLS community legal clinic operated by the University of Toronto Faculty of Law has free access to a new tool from Blue J Legal, an emerging AI start-up firm founded by U of T law professors Benjamin Alarie, Anthony Niblett and Albert Yoon. Employment Foresight harnesses artificial intelligence and machine learning to predict legal outcomes, scanning mountains of data and case law to help users who feed it customized information from a questionnaire to asses a client’s situation. 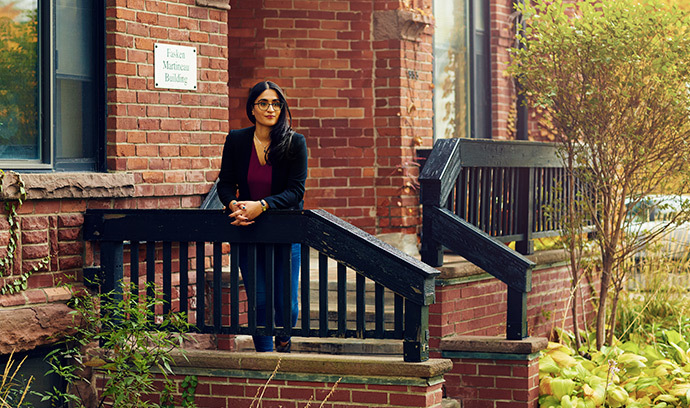 “I ran the woman’s information through the tool and it took me all of 15 minutes to give her a sense of what her entitlements were,” says Sukhmani Virdi, a second-year law student in the Employment Law Division at the clinic, who was able to assure the accountant the offer was fair and give her peace of mind. In another case, Virdi was able to use Employment Foresight to quickly asses that a laid-off employee seeking help from the clinic was being offered almost $2,000 less by their employer than what they were likely entitled to be paid. “We have a high demand for our services, and without a tool like this, we wouldn’t have the time to take on these summary advice cases for people who fall in that [income] gap,” says Jennifer Fehr, DLS staff lawyer, adding that the clinic now uses the Blue J Legal software for about 70 per cent of the cases in its Employment Law Division. Summary legal advice is a growing part of the employment law cases the clinic takes on, even for clients who are financially eligible for legal representation, generally minimum-wage employees making $20,000 or less a year. The clinic uses the tool to augment its own research and legal assessments, and its time-saving case law features give students a chance to get experience with things like summary advice while increasing their capacity to deal with more clients. Fehr says the new tool is invaluable in two particular areas—determining how much money people who are terminated from their jobs are entitled to, and ensuring employers do not misclassify employees as contactors to avoid paying benefits. While the province’s Employment Standards Act lays out mandatory amounts for termination pay based on time of service, many people don’t realize they could qualify for more money under a general set of guidelines known as “reasonable notice at common law,” says Fehr. Reasonable notice entitlements at common law are usually calculated on the basis of age, length of employment, the availability of similar work, the nature of the job andother smaller factors. It is based on court cases and precedent, but employees often feel pressured because their employer has given them a deadline to sign their termination agreement, and they don’t feel they have the time to get legal advice or do the research themselves. Fehr says those cases had been difficult for the clinic to take on because of time constraints and the amount of case law research involved, but Employment Foresight includes a reasonable notice calculator that cuts that time considerably. The clinic even quotes the findings of the Employment Foresight tool in its initial demand letter to employers, and takes cases it cites as the most relevant into settlement negotiations with employers. Employment Foresight also includes a feature that helps determine whether someone has been misclassified as an independent contractor, instead of an employee entitled to such things as a minimum wage, vacation pay, overtime, and CPP and EI contributions. “I’m not aware of another tool for reasonable notice that assesses independent contractors versus employees,” says Fehr. It’s particularly gratifying to give back to a university that’s been such a hotbed of talent for Blue J Legal, says Alarie. Approximately half the company’s 24 employees graduated from U of T.
The company started in 2015 with an AI tool called Tax Foresight that predicts the outcome of tax cases, and took the employment version to market late last year. Alarie says that at Fehr’s suggestion, the company is now starting to offer Employment Foresight free to other community legal clinics across the province. “The reports we can generate from the tool provide clients with a clear picture of their entitlements and a level of comfort when making decisions about whether to proceed with litigation,” says U of T Law alum Kelly Slade-Kerr, managing partner at labour and employment law firm HHBG Lawyers—Employment Justice, which serves clients from offices in Surrey and Vancouver, BC. The Employment Foresight product took about six months to develop after being inspired by feedback from clients, and Alarie says more offerings are in the pipeline. Early adopters of the company’s signature Tax Foresight AI tool are eagerly anticipating what might come next. Robert Santia says he incorporates the Tax Foresight tool into his practice whenever possible and finds it a great way to make research more efficient and augment his work. “The future of legal research is going in the direction of AI and tools like this, and I am excited to embrace this technology,” says Santia, who graduated from U of T Law in 2014 and is now an associate in the tax and estates group with Toronto law firm Aird & Berlis.